Richard Wrangham has been studying chimpanzees at the Kibale Chimpanzee Project in Uganda since 1987, when he founded the research center. A student of famed primatologist Jane Goodall, Harvard's Ruth B. Moore Professor of Biological Anthropology has studied primate behavior, ecology, and nutrition for nearly 50 years. Wrangham says his new book, The Goodness Paradox: The Strange Relationship Between Virtue and Violence in Human Evolution, is his first attempt to examine his own species in detail. He will discuss his theory about aggression as it connects to capital punishment on Wednesday at 6 p.m. at the Science Center Book Talk, Hall C, 1 Oxford St. His talk is free and open to the public. In advance of his appearance, he shared his thoughts with the Gazette. WRANGHAM: I've been teaching this material for some time, and a former student, Luke Glowacki, pointed out that these views are not widely known. I think it is important to be as accurate as possible in understanding human aggression. I've been thinking about the problem of self-domestication for 20 years, and now seemed the right time because work in this area has been accelerating excitingly in fields such as genetics and neurobiology, as well as paleoanthropology and primatology. What this book does is scientific journalism in the sense that it's reporting on a lot of work by others, but it pulls it together in a new kind of focus. Aggression has traditionally been regarded just as it always has in anthropology as a single type of behavioral tendency, which has led scholars to be divided between those who regard us as a particularly tolerant, pleasant species, as in some ways we are, and those who see us as an especially violent, competitive species, as we also are. In fact, however, there are two kinds of aggression, a distinction that solves a whole series of problems concerned with understanding human nature. To see aggression as falling into two types has been conventional wisdom in biology and psychology for decades, but the difference has barely been recognized previously in anthropology. GAZETTE: You write at length about proactive and reactive aggression, but it's the former that gives us virtue. Can you explain? GAZETTE: Presumably, cooperation plays a critical part in humans' capacity for capital punishment? WRANGHAM: Cooperation is a big part of the story in the sense that it's only as a result of our ability to cooperate that our ancestors were able to control the aggressiveness of the most extremely violent males. It was absolutely critical that the subordinate males were able to come together to cooperate. The argument I make is that this depended entirely on a sufficiently sophisticated language. WRANGHAM: Some of the scholars writing in this area have argued that, with the evolution of weapons, humans were able to develop capital punishment because with a weapon you can surprise someone and kill them. But that doesn't seem to me anything like as important as language. We would almost certainly have had killing weapons long before 300,000 years ago, which is the time when fossils reveal the earliest consequences of selection against reactive aggression. Chimpanzees are perfectly capable of collaborating with each other to kill members of neighboring groups—and even sometimes members of their own group. But they do not have the linguistic ability to be able to choose a particular victim; the best they can do is to respond to the presence of someone who is a predictably hostile enemy for all of them. 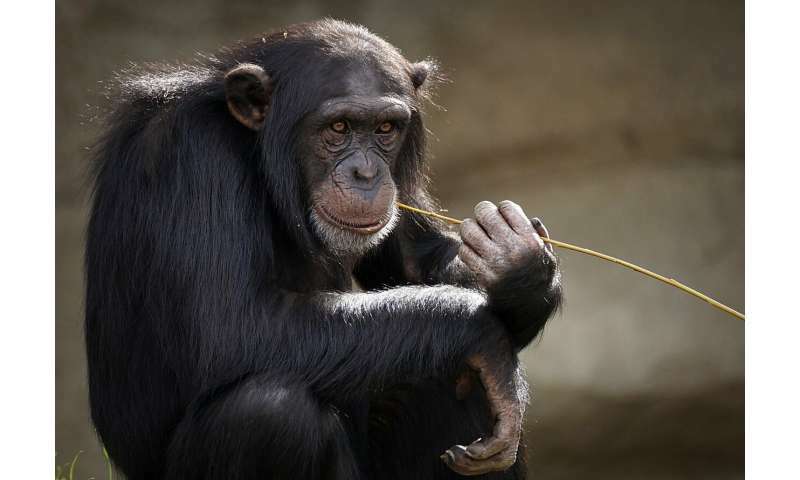 Chimpanzees are capable of killing without weapons, just as humans are, but they are incapable of capital punishment. What capital punishment needs is the ability to make a plan and to coordinate that plan. WRANGHAM: Biologists have known for decades that aggression works in different ways, whether you are stalking and attacking an individual by surprise, or if you're reacting by losing your temper. However, although this has been understood to be two types of aggression, it's only in the last five years that people have been able to identify rather precisely the biological mechanisms in the brain that are associated with these two types of aggressions. A lab in Budapest, Hungary, is leading the way on this. The rats they work with will sometimes attack each other by surprise and go for vulnerable parts of the body in an effort to kill their opponents; in different circumstances rats just end up fighting over food or females. Experiments show that the same parts of the brain are involved in the two types of aggression—that is, proactive and reactive—but the wiring that leads between the brain regions is different. Knowing that the biological mechanism is different between proactive and reactive aggression, we can also conclude that natural selection can change these two kinds of aggression independently. For instance, you can produce breeds of rats that are particularly elevated in their tendency of proactive aggression, but reduced for reactive aggressive, which is what happened in human evolution. The fascinating question at the heart of my book is why you get that extraordinary combination. WRANGHAM: I've been puzzling about it for more than 20 years. In 1996, I wrote a book called "Demonic Males: Apes and the Origins of Human Violence," which was focused on the question of why chimpanzees and humans share this very remarkable, rare property of getting together in small groups and making very deliberate attempts to hunt down and kill members of neighboring groups. I was already aware that chimps were much more aggressive within groups than humans are, which raised a fascinating question: How come humans are so different in that respect? WRANGHAM: Rousseau says we're naturally nonviolent; Hobbes says we're naturally violent. The new perspective says that in different ways they are both correct. Then the question that emerges is: Should we be very depressed that humans do have this high propensity for proactive violence, which is basically what is responsible for war? Proactive violence has been a hugely important component of history and prehistory, but the special thing about proactive violence is that animals and even humans don't spontaneously engage in it if it looks risky—in other words, if it will hurt or be dangerous for the protagonists. Another quite different line of argument is that this new view gives us for the first time a concrete theory on why Homo sapiens evolved. Homo sapiens is different from other species of Homo by being a somewhat lighter-boned form, with reduced differences between the sexes. The standard explanation of our origins is that our ancestors became more and more skilled in inventing and retaining cultural skills. As a result, they were able to rely less than before on brute force in their foraging, so Homo sapiens emerged as a more delicate form. But what is so striking about Homo sapiens is that we are not merely strikingly gracile, but the ways in which we are different from our ancestors are like the differences between a dog and a wolf. The origin of Homo sapiens, in other words, can be traced to self-domestication—and therefore to the sophistication of language that made capital punishment possible for the first time in any mammal more than 300,000 years ago.